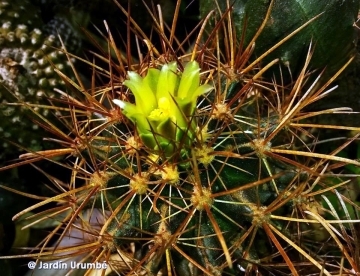 Habitat: This cactus grows in plains, rock hilltop and floodplain on very shallow gravelly, calcareous soil over limestone rocks, in open areas with only short grass cover within Juniperus ashei-Quercus fusiformis plant association. Threats to the species include collecting and development in its habitat. 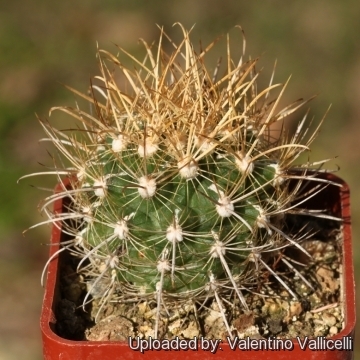 Description: Sclerocactus brevihamatus subsp. 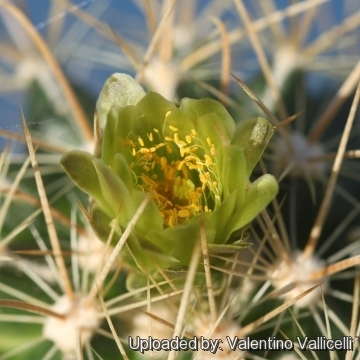 tobuschii is a small deep-seated cactus with hooked spines. The plant is usually solitary and almost identical to the standard species but with fewer radial spines, flatter stems and with flower tending to appear a little late. Stem: Unbranched, globose to nearly flat flattened, often inconspicuous, dark green to grey-green, 5-7,5 cm high, up to 10 cm in diameter. The stems of immature specimens, are not obscured by spines. Central spines: 1-5 (mostly 4), light yellow with red tips, uppermost two V-shaped (often with 1 or 2 extra smaller centrals), 20-45 cm long, lowermost one always hooked at the tip, like a fishhook, 22-30(45) mm long. Radial spines: 7-9 irregularly spreading white or greyish, straight, needle-like, 10-20 mm long. Flowers: Diurnal, funnelform, inconspicuous, from the adaxial edge of the areoles an the top of the plant, 2,5-3 cm long, 2,5-4 cm in diameter, opening fully, greenish-yellow, light yellow or creamy white, sometime with reddish-brown central strips. Filaments and anthers yellowish. Stigma lobes green, yellow, or whitish. Blooming season: Flowering late February though April. The flower may open again on the second day. Fruits: Elongate egg-shaped, thin walled, about 15-30 mm long, 1-1.5 cm wide, fleshy, nearly naked, greenish, ripening to pink or pinkish- brown by late spring or early summer. Seeds: Kidney-shaped 1,7-2 mm long, dark brown to black and shinning. Sclerocactus brevihamatus (Engelm.) D.R.Hunt: (subsp. brevihamatus) has 12-22 radial spines, larger and more cylindrical stems and the flowers are dusky rose to yellowish-pink or olivaceous in late February-March. Distribution: Edwards Plateau of Texas southern and western border. Sclerocactus brevihamatus subs. 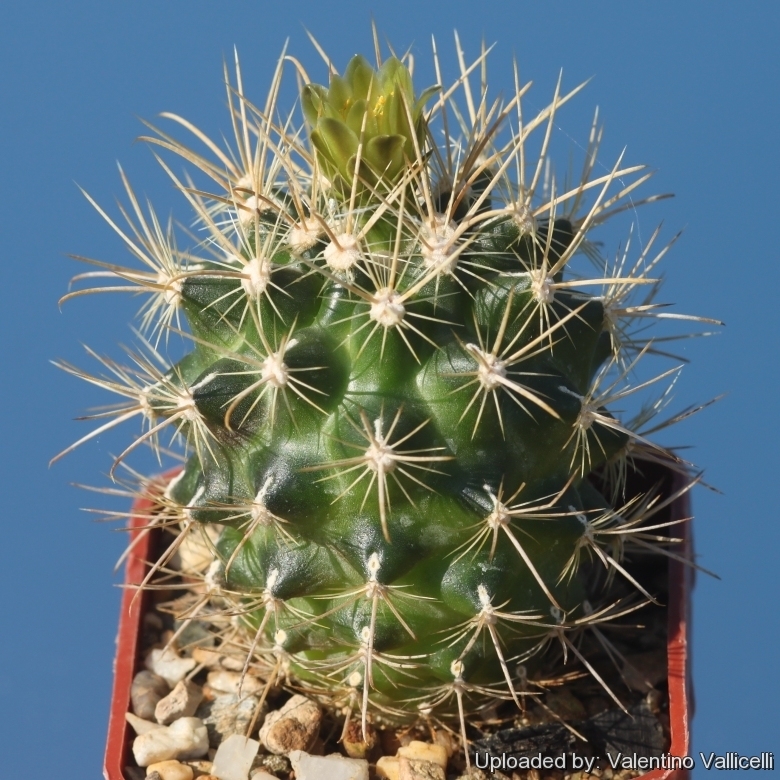 tobuschi (W.T.Marshall) N.P.Taylor: has nearly flat body, 7-9 irregularly spreading radial spines and hooked central spines, flowers are light yellow to cream flowers in late March-April. Distribution: Edwards Plateau. 1) Sutton, K., et al. (1997). “Habitat of Ancistrocactus tobuschii (Tobusch fishhook cactus, Cactaceae) on the Edwards Plateau of Central Texas.” Southwestern Naturalist 42:4 441. - Mealy bugs: Mealy bugs occasionally they develop aerial into the new leaves and flowers with disfiguring results, but the worst types develop underground on the roots and are invisible except by their effects.